Today is Bess Houdini's birthday. She was born January 23, 1876 in Brooklyn, New York. For the occasion, I thought I'd share a piece of information I only recently discovered. I've always wondered when Bess officially left the act. This clipping from the June 13, 1908 issue of Variety finally provided the answer. 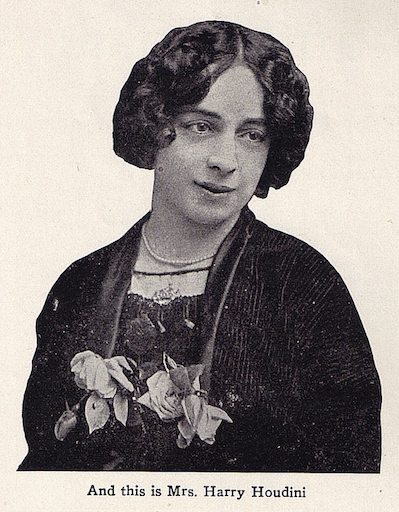 Bess made a brief comeback in 1914 doing Metamorphosis in the short-lived Grand Magical Revue. Houdini wrote in his diary that she was "magnificent" and "working as though she never retired." Bess would then periodically return to assist her husband on special occasions, such as a 1922 S.A.M. banquet attended by Sir Arthur Conan Doyle where the Houdinis used his coat during Metamorphosis. In 1925, Bess returned and became a full-time part of Houdini's 3 Shows in One. In fact, she was so much a part of the show, she even had her own poster. Happy birthday great aunt Bess. This is great (I know, I always say that!) Dorothy Young's recollections about touring with the Houdinis, as well as Marie Hinson's amazing audio recollections about them, brought Bess to vibrant life for me in a way no biography ever did (although the books were certainly a big part of it as well). Happy Birthday, Bess (a day later). While rose-colored, the Kellock book gives a great sense of Bess. Some of her first hand stories are very funny and show her to have been a real firecracker, which I don't doubt. There's still A LOT of mystery around Bess. I do think there's a chance she was an alcoholic. But not a bad or unpleasant or unmanageable person in this regard. Just a fan of getting loose--maybe everyday by noon. There seems to be a lot of dealing with her "health" and Houdini seems to have frequent concern (some might say fear) about her "mood". So it's possible this was a factor in their marriage. One thing that strikes me are her letters. They are very eloquent with perfect spelling and grammar (very different from her husband). But like Houdini, she grew up in a poor German speaking family and, especially being a woman at this time, must not have received much education. Yet her letters suggest she was educated, or was somehow able to educate herself. She was clearly very, very bright. So she's a puzzle, but I love her. I grab onto anything that helps me understand her better. Yes, I recall that about Kellock's book, but not in detail as it's been awhile since I looked at it. Based on your comments, I will make it a point to go revisit it soon. Re. her drinking - when I went to Cynthia von Buhler's play, I was assigned to follow Bess, and when Tess (the actress who played her) started talking to me in character before the show officially began, I saw that the booziness would be a key part of her characterization. I was initially taken aback because I wasn't sure where they might go with it, but quickly warmed to the portrayal as there was nothing to keep one at a distance, but rather a fragility, humor and vulnerability - which I suspect was probably much like the real Bess (in addition to the wild streak and probably a certain feistiness when necessary). I've also seen the refined qualities you mention in her letters, and I think her diction and elocution (at least when she was "on") may have even been better than Harry's!